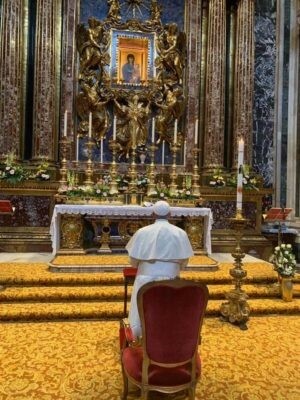 Upon his return from Panama, the Holy Father made sure to drop by Saint Mary Major to pray before the image of our Lady Salus Populi Romani. On March 14, 2014, the day after he was elected Pope, the Pontiff paid a visit here to entrust his pontificate to the Blessed Virgin. He has made it a point to greet Our Lady before and after each papal trip, starting with the apostolic journey to the World Youth Day in Rio de Janeiro in July 2013. Previous PostFRANCISCO VIZEU PINHEIRO, ARCHITECT AND CATECHIST – We are free to decide between good and evil. The way we choose matters.